I've reached the point where posting my shopping list is becoming a bit of a chore so I'm not going to do it anymore. I won't shut down my blog but I will only post occasionally when I try a new recipe or product and that sort of thing. I might also occasionally feature an old favorite recipe or mention what I've been cooking. I won't be posting my shopping list this week. 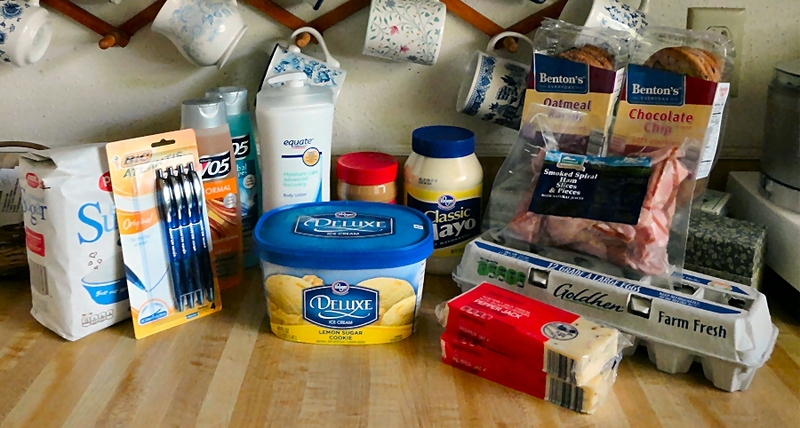 I did my regular grocery shopping this morning but didn't have time to take photos before we went out for the day. I was just looking over the new Aldi ad for this week online and I see that they've got a new product. 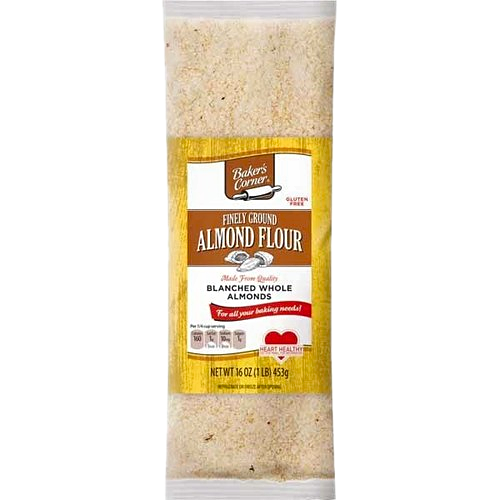 It's blanched almond flour. They're selling it for $7.99 for a one pound bag. That's not a bad price so I might give it a try. I did my shopping today instead of tomorrow. I went over budget again this week but I was running very low on ground beef in the freezer and Kroger had a good deal that I couldn't pass up. Food Town hasn't had any marked down in a few weeks. Kroger has their 3-pound rolls of ground beef for $1.99 pound this week which is a very good price. On top of that, I got the 10% senior discount plus I had a coupon good for $1.50 off one roll. I was only going to buy two rolls but at the last minute decided to go ahead and splurge on a third one. I paid $1.62 pound after the discounts. When I got home I first made a batch of Bread & Butter Pickled Jalapeños and then browned up six pounds of hamburger. I'm going to freeze it in plastic containers and then use it for my breakfasts. I've been eating hamburger patties for breakfast for a while but I've only got five cooked patties left and I decided that browning it was easier than making six pounds of hamburger patties in my Nuwave oven. I was happy to see that the price of eggs is gradually starting to go down again at Aldi. I wasn't planning to buy the jalapeños there today but went ahead and got some when I saw that the price was lower than it's been for a while. The steaks that I got marked down at Food Town on Tuesday were originally just over $9.00 per pound and I paid $3.99 pound. They look like bone-in ribeye steaks. I got a pretty good deal on those two steaks. They were marked down to $3.99 pound which is less than half price according to the stickers. Gone are the days of finding ribeye steaks marked down to $1.99 pound and 99-cents pound marked down hamburger. Beef has more than doubled in price over the past few years. I bought the green peppers at Sprouts this morning to make Sloppy Joe Stuffed Peppers. I'm heading to the kitchen right now to make them. I made Houston Chicken for dinner last night and boy was that tasty. I had some super smoky bacon pieces to use up so I scattered the extra ones around the chicken and it got all crispy while the chicken cooked. I ended up having to broil the chicken instead of baking it to get the thick bacon fully cooked but it came out perfect. Tonight we get to have the leftovers. I made two huge chicken breasts and we split one of them last night. I took today's photo with the light in the kitchen turned off and no flash. It's rather dark but still better than if I'd had the bright ceiling light turned on. Low carb on one side and not so low carb on the other. I found a few bargains in the clearance bin. I'm still having hard time taking good photos of my groceries. There's apparently not enough light in the kitchen with the light turned off. They're a little better without the light on but they won't be as good as they used to be anymore. There is probably a setting I could change on my camera but I have no idea what to do. I just set it to "point and shoot" and never bother with the settings. I stocked up on some staples at Kroger today so that I could get the buy one/get one free deal on the Private Selection ice cream. You had to spend at least $10.00 and I didn't need enough stuff this week to make $10.00 without buying a few extra items. So, I stocked up on some frozen veggies, the sambal oelek, plastic wrap and napkins. HEB was out of the quarts of heavy cream once again but I went ahead and bought a pint. I'm not eating yogurt for breakfast at the moment so I don't really need that much cream on hand. 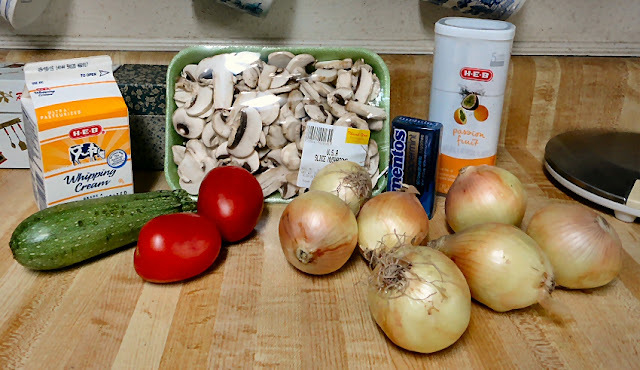 I also use cream to make quiches for my husband but I decided to save some money and use half & half instead. I've got enough heavy cream on hand to make whipped cream for the strawberry shortcake. As I mentioned on Tuesday, Kroger was out of the .69lb bone-in chicken thighs so I bought a small pork loin roast that was on sale instead. Although I'm no longer posting my weekly menus, I thought I'd mention a few things that I'm planning to make over the next week. 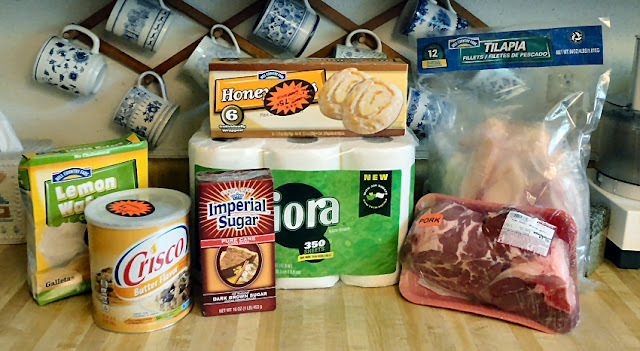 Tomorrow I will make a low carb pound cake and will use it to make strawberry shortcake for the 4th of July. I had a bag of frozen strawberries which I will add to the fresh ones that I bought today. That was a super price on them at Aldi. They were advertised as $1.19 this week but there was a "manager's special" at my store. I'll also be making pizza, Italian Meatball Burgers, Houston Chicken and Cauliflower & Ham Salad. I will only make the cauliflower salad if they have a good price on cauliflower at Food Town next week.